» Forum » Tech » Tech: Modern games » Shadow Sanctum Wall Issue - SOLVED! » Shadow Sanctum Wall Issue - SOLVED! Shadow Sanctum Wall Issue - SOLVED! I have been having a weird intermittent issue with the sanctum wall and sanctum kickout on my Shadow. It happens 50% of the time I am playing. Sometimes when I hit the sanctum the wall just drops. With the wall down I will hit the sanctum shot and it then kicks the ball out of the sanctum area instead of holding onto the ball and kicking a new one out of the shooter lane. I have checked the switches behind the sanctum and they register fine in switch tests, replaced and rebuilt the sanctum wall switch. I have attached a video since I am sure I am not describing the problem as well as I could. In the video the first ball lock acts fine, but then kicks the ball out from behind the sanctum. The 2nd time I hit the wall it drops immediately. At :19 you will see the wall drop when the ball strikes it, and again at :35. The multi-ball after the 3rd lock only put one ball into play. This may sound odd but check the trough optos. They are all registering fine. Add a ball at a time and they all indicate closed when a ball is in front of that opto. Also, I added to new balls to make sure there wasn't any magnitism affecting it. Check the sanctum switches in test by rolling a ball over them. Pressing on them can trigger when a ball does not. If so, adjust or replace switches as needed. Sweet new problem now (although they are probably related?) while making sure all connections were solid (games waspowered on) I lost the DMD all of the sudden. It boots up and gives me a single line (see image). I have a Rottendog board and the +50v light and +20v led are now off. 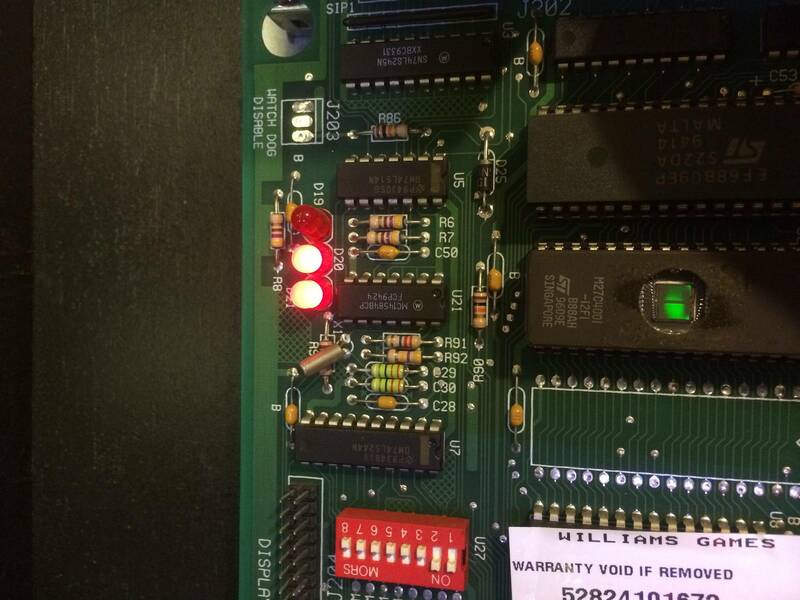 Also, on the CPU security board the D20 led flashes (pic attached, but obviously you can't see it flashing). Periodically the game will reset and the D19 led will light up and then shut off. Diagnosing board work is hard for me, so any help as to what will probably need replacing is appreciated! Check fuses for continuity with voltage tester. That's a bad noise when the ball locks. I might check the sanctum wall assembly switches to see if they are adjusted properly. If your optos are working at the sanctum, perhaps the game isn't seeing the wall fall and thinks the ball should not be in the lock. There's a switch at the bottom of the wall. Check it n test when the wall falls. Ok, I am an idiot. Re-seated all the cables in the backbox and the DMD is back up an running. I am still dealing with the sanctum wall dropping when the ball passes the optos. Everything passes in switch test mode. All optos including sanctum and ball trough register. Any ideas? My machine when i had it didnt make that sound when you lock the ball at the sanctum. as Carl_694 said, check the wall assembly, or wherever that loud noise is coming from? Not a bad idea...but find out where that buzzing is coming from, it's not the magnet, you can hear the magnet hum when it's holding the ball, I think the buzz is coming from the diverter behind the sanctum, it maybe getting stuck when it's trying to lock the ball. See the metal diverter...I bet this is what's getting stuck, you may need to rebuild it. My shadow looked almost like that at one point! - The metal diverter kicks the balls out fine (that is the part you were referring to? 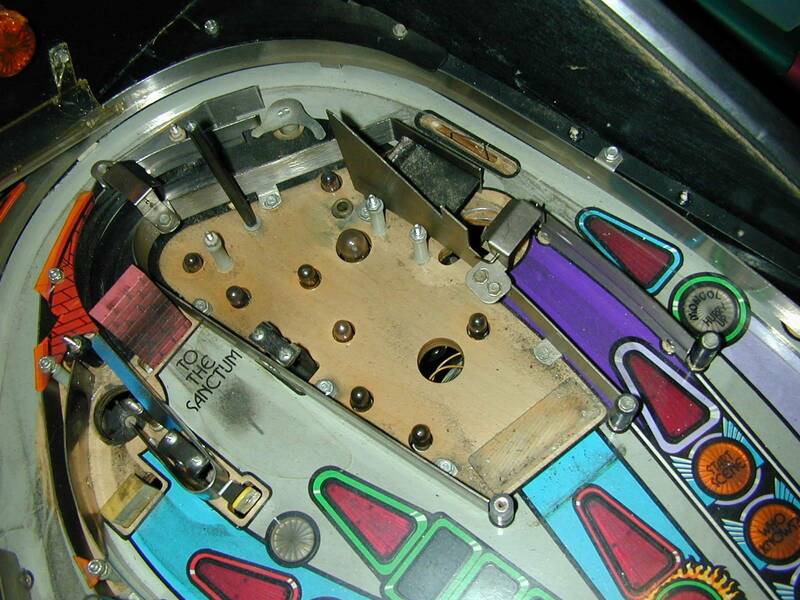 ), but I will take a look tonight and see if something strange is going on with it under the playfield. - All "lockup" switched behind sanctum wall check out fine, however using voltmeter the middle lockup is showing me 635 when the switch is depressed, while the left and right are showing 735. I am planning on replacing the diode on the middle switch. 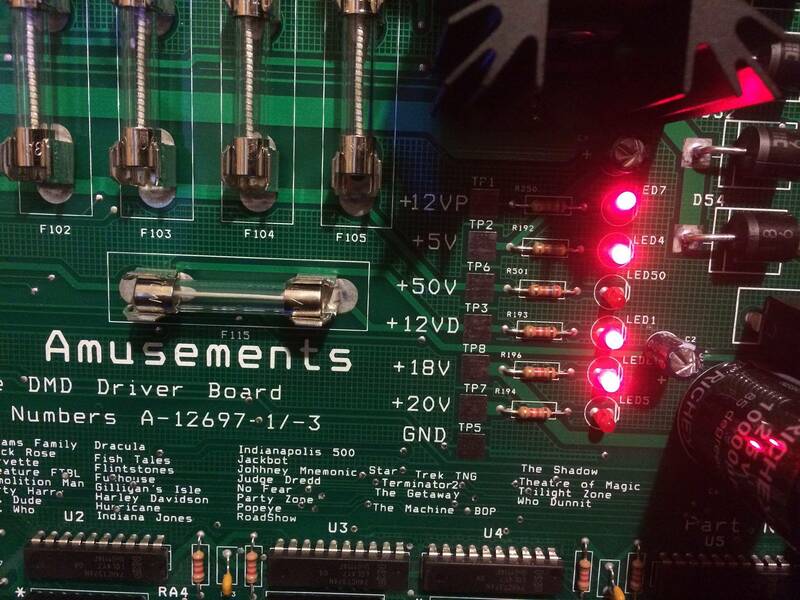 I believe the buzz is the sound of the playfield plastic vibrating on top of the left sanctum opto, but will re-confirm. It is weird, I always thought that was a normal noise since I haven't played too many other Shadows! My next thought is to replace the Sanctum optos. They pass all tests, but perhaps they are starting to get flaky? Thanks again for everyone's help, any ideas are always appreciated! that looks more like a "The Sadow"
I have no idea whose Shadow that is...I picked it up on the internet to help illustrate. And you are sure the bottom switch on the wall is ALWAYS being made when the wall drops? I had to bend the arm when I replaced that switch. Did you? There is also, if I recall, armature that can wear prematurely. Check out this thread. I had to replace it on mine. 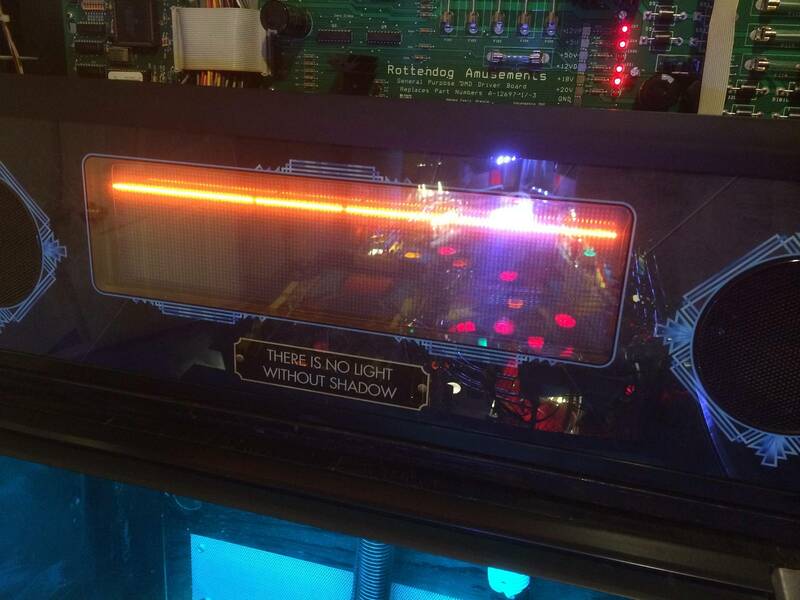 https://pinside.com/pinball/forum/topic/the-shadow-wall-drop-target-stuck-up. I just watched the video again, the machine knows when the 3rd ball is in the sanctum and it starts the multiball with only the one ball, so I have to say your machine thinks it's missing 2 balls....You need to take the balls out and put them in one by one in the switch test and make sure it's registering in the switch test matrix. That is a great idea! I will try it and let you know how it works out. Thanks! Ok! I agree with your diagnosis, but your prescription is a little opiated for this patient! If trough optos haven't been replaced, I always recommend replacing them all on both sides. This costs less than $5, and takes about 15 min. Don't buy replacement boards with SMD's as down the road, they seem to form the problems again, but faster (I'm guessing due to surface mount parts being more prone to vibration over through hole parts, with more strength). The video really suggests to me though that the ball is maybe engaging the first and second sanctum lock, possibly sitting over the second lock switch partially, and never making it completely in. I would concentrate there first, and look to the troughs after. Your eyes are you best tool for PF issues. Opiated? Lol...ok. Funny but still wrong, if the diverter is kicking the ball out, which means then it know the ball is in the sanctum so the switch idea doesn't hold water. The only way it will kick the ball out rather than lock it is if it thinks theres only one ball in the machine. Besides if the switch was not fully engaging it would first go into ball search then kick out the ball...if you watch the video it shows the ball releasing from the sanctum immediately. If fact, I would never be slamming my hand on any of my PFs. Then good luck fixing intermittent opto problems..I guess shot gunning parts is much better. It's not shot gunning for troughs. If one is ready to go, others are too. I used to spend all kinds of time with a digital camera finding the one issue in a trough, only to have another go a few weeks later. There is so much vibration there, that the best way to tackle troughs is the pull both sides and replace all emitters and receivers, and reinstall with small post rubbers between the screws to lessen the vibration. It’s more of a rebuild than a shot gunning approach, and produces rock solid troughs for years after. I have never had to deal with another trough issue to date from doing this method, where before when looking for a single issue, another always cropped up sooner or later. This method came from experience, but hey, maybe you enjoy doing repairs over playing more than I. Thanks for everyone's advice, I really appreciate the fact that fellow Pinsiders are so eager to share their fixes and troubleshooting ideas! I won't get a chance to work on the pin till early next week, but I will make sure to follow up and let everyone know how the progress is coming. You all have given me a good list of tests to perform, and I look forward to getting this issue fixed once and for all. Great except you quoted my post and said that it was opiated, and then proceded to give the wrong advice of stuck switches, and criticizing slapping of the pf..which by the way is much softer on the pf than flying steel balls. So just for my own piece of mind (not that I needed it, but...) tested the sanctum locks with something triggering the lock two when there are not two balls in there, and in fact you get exactly what you are showing in your vid. Again, I would try that first, readjusting this switch to less/more sensitive first before looking to the troughs. I have seen this before with my friends machine. it may not be it in the end, but again, easiest place to start, and after that, I would move to the trough, although with all my testing there I could not produce a situation where the sanctum spit out a ball right after one entered as with yours. Hi everyone, sorry it took so long to update this thread. I think I fixed the issue, and as usual it was a much easier, basic fix than I was expecting. Atomicboy was correct! The middle lockup switch was getting stuck on the right lockup switch. So when the first ball would lock it would engage the middle switch on its way to the right. The middle switch was getting stuck on the right switch and staying down, tricking the machine into thinking there were two balls locked. Adjusted the middle switch and presto, works like a charm! Thanks again for everyone's advice, I really appreciate all the help and knowledge I received from you all! In that case my tip of the hat to Atomicboy. However, I thought you said that it kicked the same ball out without ever locking any....which made the stuck switch idea wrong. If the machine locked the first and then it triggered 2 switches then it would have started multiball with 2 balls not 1. Also easily the switch test would have indicated 2 switches closed on the martix, which would have tipped you off of a stuck switch, (thought you said you did this) but whatever. Good luck. Yeah I ran a switch test several times. I was only having the issue pop up randomly and the switch wasn't staying stuck every time. Had it shown up during a test my problems would have been solved easily! Again, thanks for all the help. So does your machine still make the same noise or no? I have a noisy sanctum lock but no frame of reference for if it's normal.